Every year as the summer months arrive I look foward to attending craft shows as both a spectator, as well as, a vendor. I am amazed at the things people create with their hands. I love the fact that one can imagine something and then make it a reality. Most times it comes out better than the imagination. 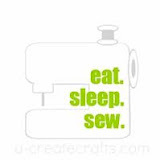 In my appreciation of those who are creative I have decided to feature an Etsy seller once a week. As you know Etsy is a place where you can buy and sell all things handmade. The first seller is SaJoMo. Please leave comments and give her visit at her store on Etsy. My name is Sally and I am British goldsmith/jewellery designer living and working in Kuala Lumpur, Malaysia. I studied my Degree in the UK and have been making ever since! I worked for various companies as a Jewellery consultant and also for myself for many years. My job has taken me all over the world and I am now even closer to the trade fairs in Asia!I have won design awards and also awards for finished items and also taken part in major exhibitions and fairs worldwide. Oooo this is a hard one as my love of colour is why I got so hooked on precious and semi precious stones and beads! 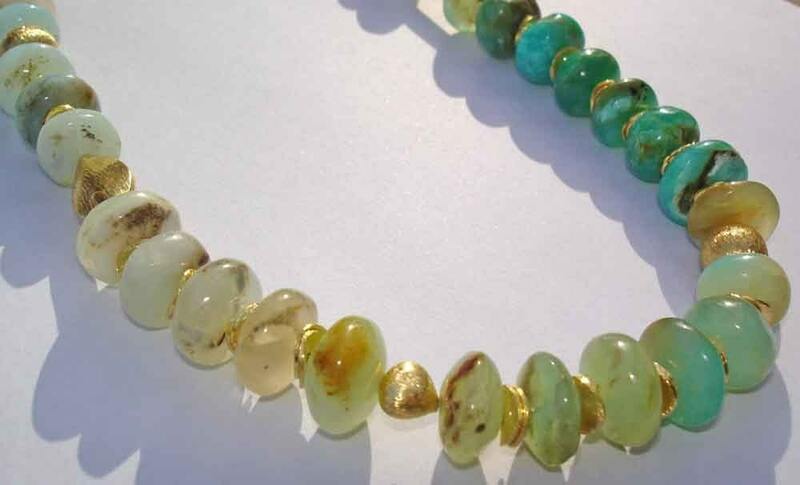 I will have to choose one of my latest combos by saying Green and Gold as I recently made and listed an Opal necklace with those colours. I had a fabulous art teacher growing up in Kenya and I remember making a crepe paper palm tree in one of my first art classes. How and why did you make it? We all had to make one and I think I won a prize for mine so it stuck in my memory. We made it by rolling up the paper and then slicing up the leaves with scissors and pulling it into shape! I haven't stopped making stuff since! They come through playing with the material in my workshop. I spend a lot of time starting again and again just to be sure of the right combination! Perfectionist tendencies can be a good and bad thing though! Very much so, I need to be in a bright space ...always with some good music on in the background and all my tools to hand! If it is too messy I can't concentrate. I have turned our spare bedroom into a fully functioning workshop with tumblers, polishers and mills etc ...everything I could need! Silver, Gold and Semi-Precious stones/beads. I like making Jewellery first and foremost but I also like to paint and draw - sketchbooks are a great thing to have to hand. Because I believe there is a certain life lost by the material if it is mass produced, it loses some warmth. Also there is nothing like owning a handmade item that has had time and effort poured into it. Unique and special is the way forward! Especially if you are commissioned to make something and work on ideas with the buyer. Be truthful about your materials and make what you enjoy making and others will appreciate your efforts. We cannot cater for EVERY taste so don’t try to - make what you want to make. Keep your prices fair to yourself and the customer. What have been the most valuable lessons learned from other artists on Etsy? To be full with descriptions!! Also to communicate well! "Talent is never enough" John Maxwell - half way through it but good so far! Any other links or information you want to share? Nope - just check out my Etsy shop if you have some time free! In ten years I'd like to be...running my own Gallery/shop selling studio Jewellery and interesting applied arts such as ceramics, glass, textiles and also some Painting, mixed media arts. Also to have a café on the premises so it loses that sometimes uncomfortable Gallery feel! Comfort and Craft! Also to do some more teaching as I enjoy passing on techniques and inspiring new talent. This site allows all those creative people to sell their creations in an atomsphere of similar to conditions. As a very creative person with a shop on Etsy (pinkicejewels.etsy.com) I have enjoyed my time there and I believe I will continue to have fun on ETSY! As a buyer of Etsy you may create an account free of charge. The is no actual bidding as on Ebay, but of course you probably could make some an offer! Each seller has their own policies and rules for purchasing their products. Etsy has been talked about in the media and to read more information visit Etsy's press site. Each day a new seller on Etsy will be featured on this blog...please continue to check back with us and read all the fabulous info on our seller.